Tomorrow at noon on the campus of Orange Coast College there will be a groundbreaking ceremony for their brand new Planetarium. 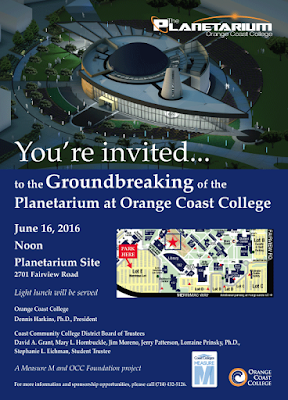 This special event is part of their Vision 2020 program for expansion and enhancement of many campus facilities. Read more about this amazing new facility HERE. The attached flyer has the particulars. The public is welcome. A light lunch will be served. CM4RG/CM1ST Town Hall A Success!